So far, so good here in New York. The drive into the Finger Lakes region was beautiful along I-86. Lush, rolling green hills made the journey quite pleasurable. 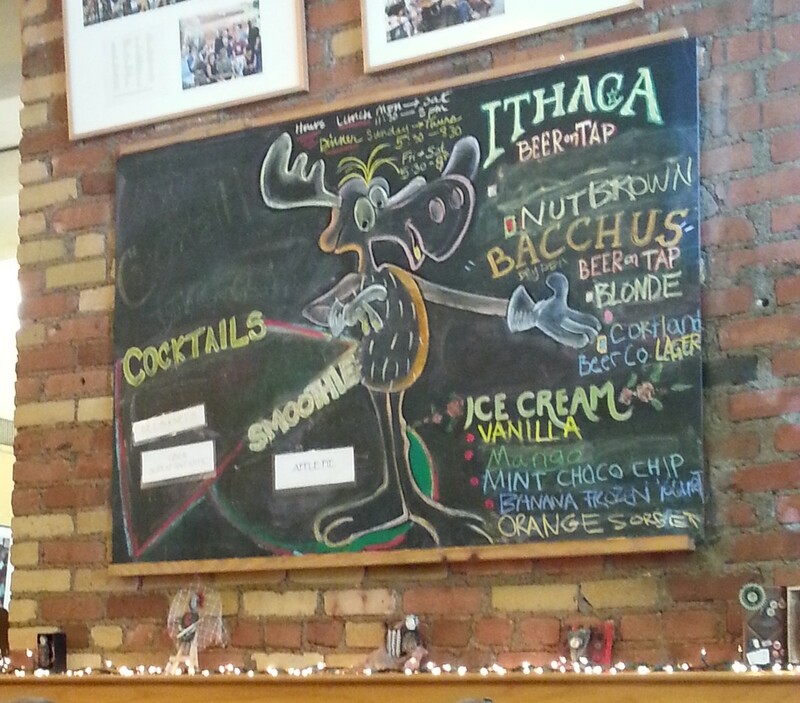 We opted for a slightly longer route to our Cayuga Lake State Park destination so that we could detour thru Ithaca and dine at the Moosewood Restaurant. I had been there once before while on a cycling trip, and was anxious to go back. 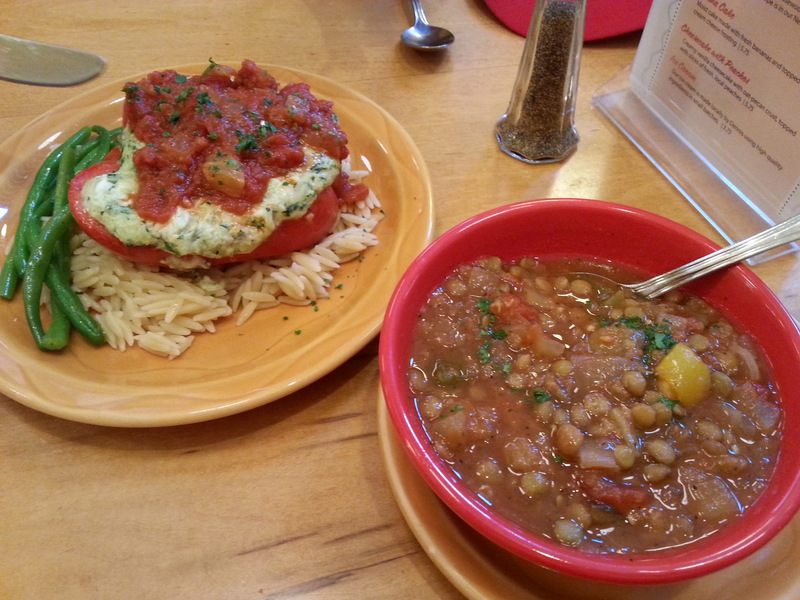 John’s stuffed pepper and my lentil soup were our reward for the additional miles. The Red Ale from Ithaca Brewing didn’t hurt our attitude, either. Sometimes, you just have to pamper yourselves a bit, right? While strolling around town, John lurched off a curb and rolled into the street – holding his iphone high for protection. He’s still mad because my first instinct was to laugh before inquiring about his well-being. “I don’t expect any sympathy from you,” were his exact words, I believe. We rolled into our campsite, which we had reserved weeks ago, to find that we are about 50 feet off a state highway. No Kidding! I sure can pick ’em. Lots of trucks and car traffic, but it quiets down at night, so it’s really not too annoying. I’m mad at myself though for not selecting one of the rustic sites across the street, which are more secluded. 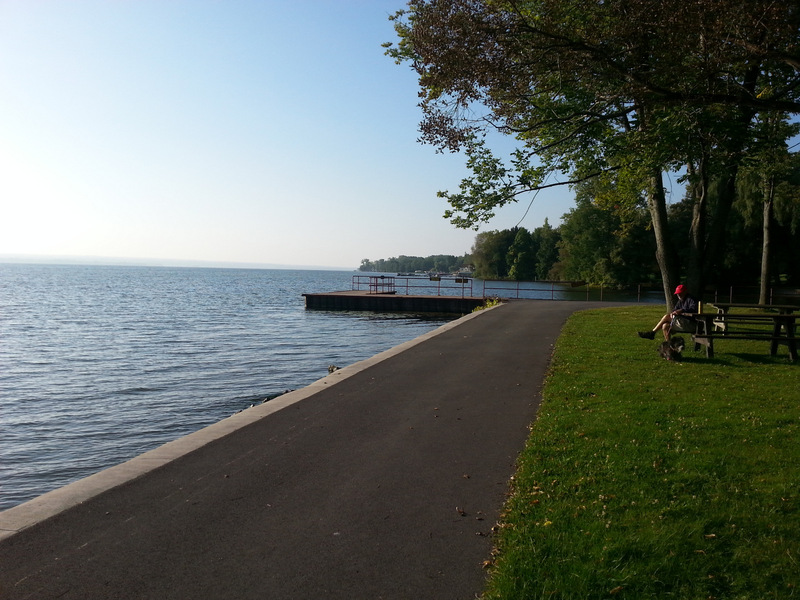 Cayuga Lake is beautiful, though. Friday (yesterday), we decided to cycle around, and check out the area. 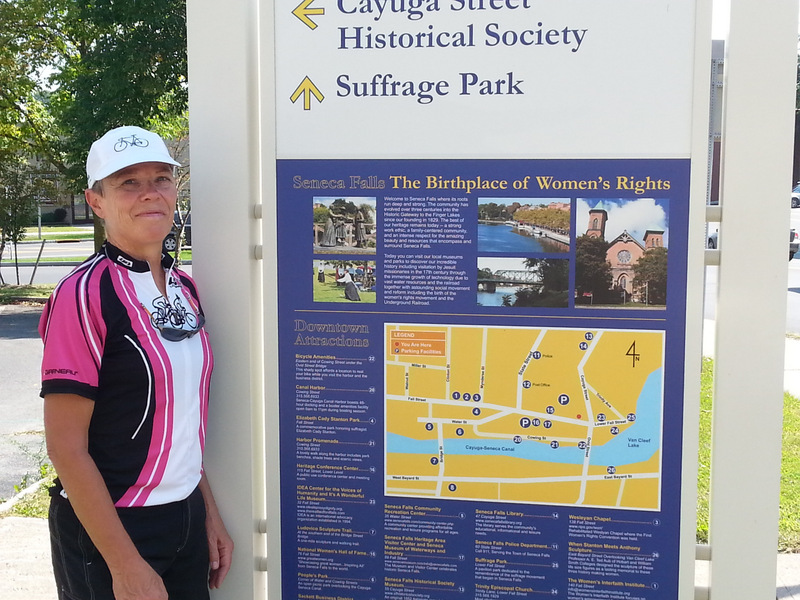 Seneca Falls is the nearest town, and it’s home to the birth of the women’s rights movement. 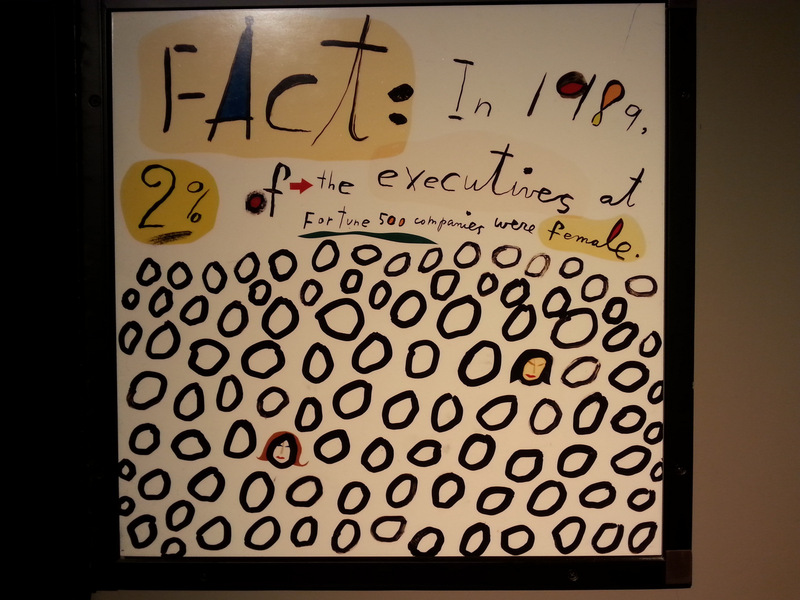 The Women’s Rights National Historical Park is crammed with photos and exhibits documenting the movement from it’s tentative beginnings. 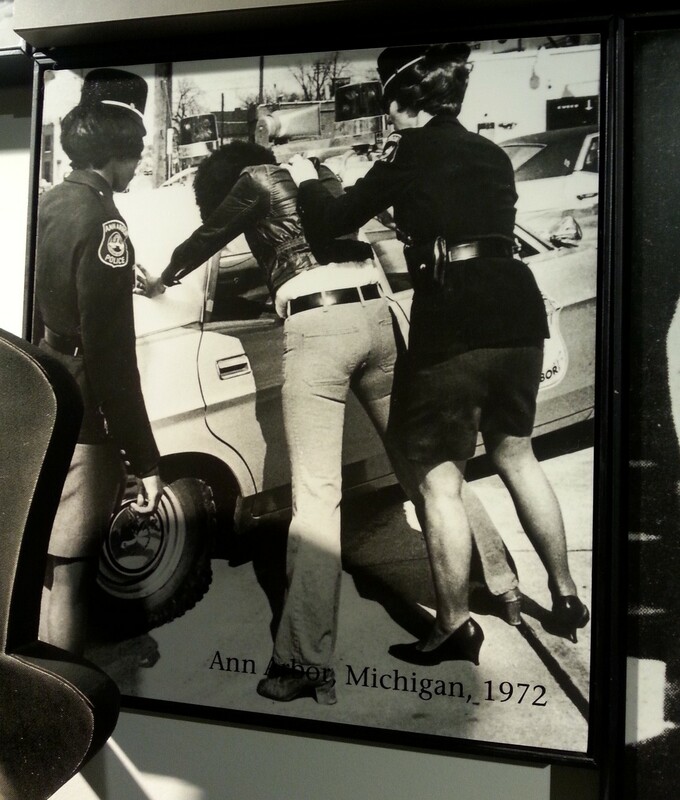 My favorite photo showing two female police officers in Ann Arbor in 1972 is below. Hard to believe that their uniform included shoes with high heels! Not easy to be a pioneer. The Women’s Hall of Fame was our next stop. 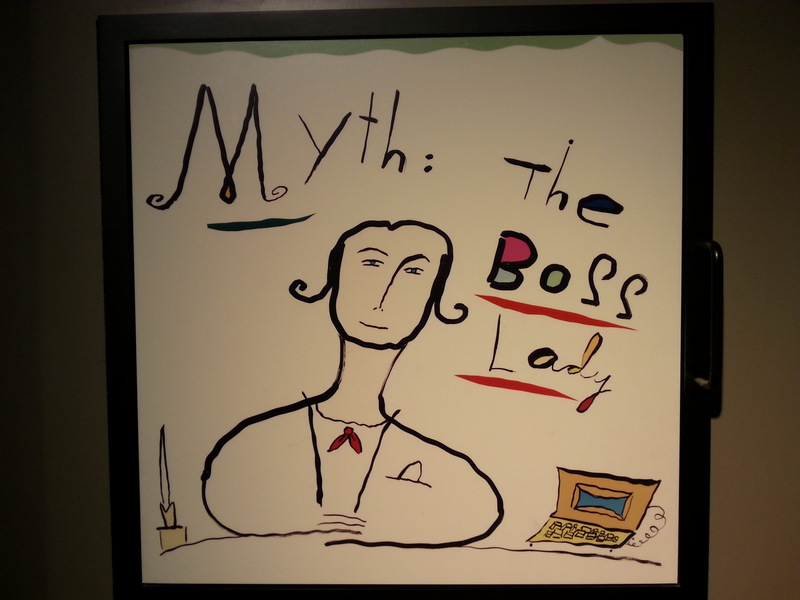 It’s a small building with framed photos and short bios of the 250 women included. Interesting, but not too lively. We pedaled on to Auburn, fighting a nasty headwind and lots of noisy traffic for about 15 miles. 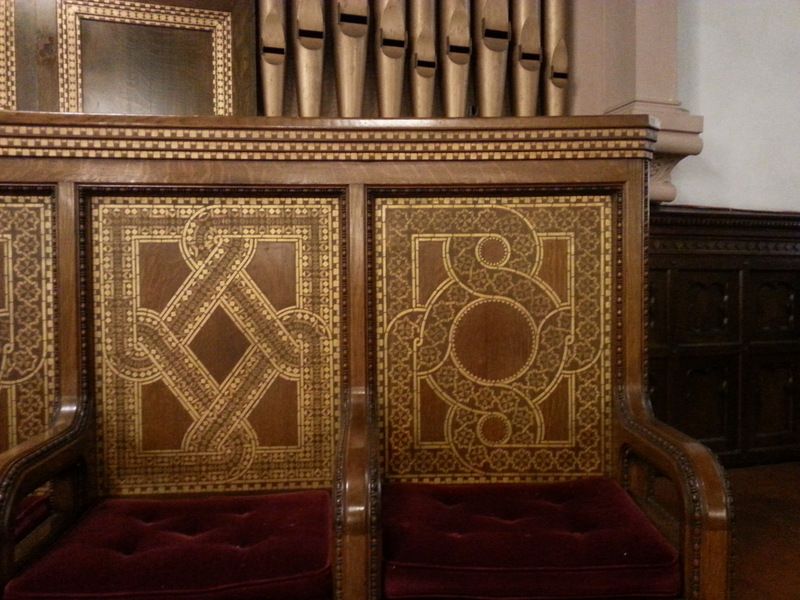 Wandered around for a bit and checked out the Willard Chapel, which is the only complete and unaltered chapel designed by the Tiffany Glass and Decorating Company known to exist. Yes, that Tiffany. 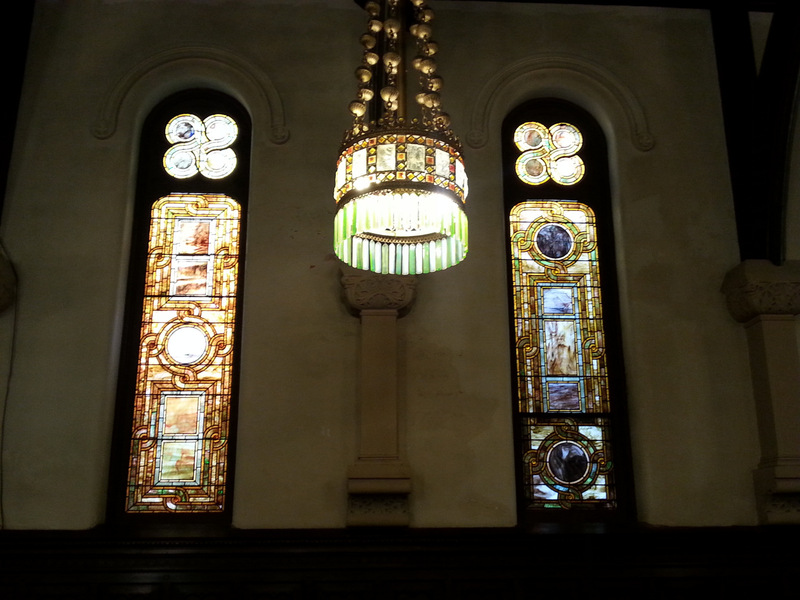 Not only are the many stained glass windows and chandeliers designed and produced by Tiffany, but the elaborate woodwork, pews, valted ceiling, altar, and mosaic floor were all designed and produced under his direction. My poor photos certainly don’t do justice to this splendid chapel. We sailed back to camp with a tailwind, picking up a load of firewood along the way, which John neatly bungeed to the back of his bike. Pretty slick. Dinner was Dutch-oven baked potatoes, the last of our homegrown tomatoes and pesto, and grilled pork chops with a coffee-pepper rub that I bought at Zingerman’s in Ann Arbor. Excellent way to polish off a great day. This entry was posted in camping, cycling, food, great outdoors, museums, national parks, RV life, simple camping and tagged camping, cycling, food, historic sites, national parks, New York, road trip, RV life, simple camping, the great outdoors by Judy Crankshaw. Bookmark the permalink. Darn you play hard and eat good! Super cool! Hopefully, John isn’t hurting after his fall. I’m living vicariously through your adventures so I love all the great description of sites and sounds, and tastes. Hope all your stops are as fun. You have to expect a few bumps in the road, but it sounds like overall, your trip is starting out well. Loved the photos of the church!